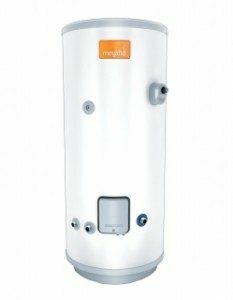 What is a Megaflo Unvented Cylinder? 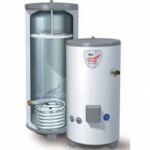 Unvented hot water cylinders store water supplied directly from the mains water supply. A heat source is provided using a gas boiler, electrical heating elements, renewable energy (solar, heat pumps, etc) or any combination of these. The cylinder stores water under relatively high pressures, typically in the region of 2 to 3 bar (20 to 30 metres head), and as such can service multiple outlets including those at high levels, such as in a loft space. The increased pressures provide for much better quality showers, without the need for pumps. With both hot and cold services supplied via the mains, there is no more need for a cold water storage tank, keeping loft spaces clear, and pipework to a minimum. 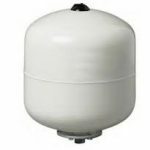 Unvented cylinders are dependant on the ‘power’ of the mains water supply that feeds them, and in order to function properly, it is essential that the water pressure and flow rates are suitable. Supply pressure should be at least 1.5 bar, and capable of supplying the required flow rates. A Pressure Reducing Valve is required on the unvented cylinders to limit the pressure of the incoming mains water to a safe level at which the cylinder is approved to operate. The difference between pressure and flow is important to understand, and whenever installing a new unvented system these should both be checked. 1. External Expansion Vessel: An expansion vessel is basically a trapped volume of pressurised air, held by a rubber diaphragm within a steel vessel. The vessel is connected by pipework to the unvented cylinder, typically onto the mains cold inlet pipework, and as water in the cylinder expands it is pushed into the expansion vessel, compressing the air within the diaphragm. As the air is compressed, its pressure, as well as that of the water in the cylinder, will increase – the larger the expansion vessel, the smaller the increase in pressure. Minimum recommended sizes must be adhered to, as must the appropriate charge pressures. As a general rule, the vessel charge pressure should be 0.2 bar below the setting of the pressure reducing valve. 2. Internal Air Bubble: Another way of accommodating expansion is by trapping a bubble of air in the top of the cylinder. This bubble compresses as the water expands, much in the same way as air in an expansion vessel. This method makes for a simpler design, without the need for having to fit or ever replace an expansion vessel, however annual servicing of the cylinder is usually required to maintain the bubble and prevent safety discharges from occurring. There are two basic dangers that unvented systems must address. First is over-pressurisation, caused by a failed pressure reducing valve, or by back pressure, from a faulty mixer valve for example. The other is overheating. If an unvented cylinder should ever overheat and reach 100°C, then instead of boiling away as it would with a vented system, the water will continue to rise in temperature and pressure until the cylinder can no longer hold the pressure and splits. At this time, the sudden reduction in pressure resulting from the split may cause water to ‘flash’ rapidly to steam. The higher the pressure at failure the more steam, and cylinders capable of taking higher pressures will fail more dramatically or even explode. Temperature and pressure relief valve – set to 90°C + 5°C. To prevent this from ever happening, there are safety requirements that have to be fulfilled. 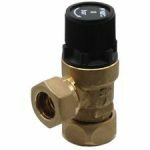 As well as the mains Pressure Reducing Valve to limit the incoming water pressure, additional protection must be taken. An Expansion Relief Valve is required to allow water to be discharged during heat up if the means of accommodating expansion has failed to operate correctly. This valve is often combined with the Pressure Reducing Valve to form a single inlet control device. A Temperature and Pressure Relief Valve, fitted near the top of the cylinder, is required to allow water to be discharged when store temperatures or pressures start approaching unsafe levels. Any water discharged in this way will typically be replaced by incoming cold mains water that will prevent store temperatures from rising further. Both relief valves make use of a Discharge Pipe and Tundish to allow water to be released from the store under fault conditions. Discharge pipes are typically 15mm up to the Tundish, and then on in 22mm to a safe discharge point outside. Certain systems layouts and longer pipe runs will require larger pipe sizes as laid down in the G3 Building Regulations. To complete the array of safety controls, all indirect unvented cylinders require that the flow from the boiler to the store is fitted with a Motorised Isolating Valve which will close when an Overheat Thermostat (manually reset) fitted to the store detects overheat. Likewise, immersion heaters must have a built in overheat thermostat. Megaflo cylinders are constructed from duplex stainless steel and offers superior resistance to corrosion, especially in aggressive water areas. Every unit is pressure tested in the factory to 15 bar – five times the normal operating pressure – making Megaflo eco suitable for all domestic and commercial applications. Megaflo offers very fast heat recovery times and deliver superb flow rates of up to 72 litres per minute, making it ideally suited to a wide variety of applications. The cylinders are insulated with a 60mm thick void-free layer of high-performance polyurethane foam. This fills the space between the inner vessel and outer casing for maximum insulation efficiency and compliancy with future European-wide legislation. Constructed in Duplex stainless steel for maximum strength – pressure tested to 15 bar. Patented internal floating baffle system to accommodate water expansion. No anode – eliminates costly anode maintenance. Insulated casing for the temperature and pressure relief valve to minimise heat loss. Unique ‘L-shaped’ long-life Superloy immersion heater reaches deeper into the tank giving more hot water. Patented cold water inlet diffuser minimises mixing of cold and hot water. High performance ‘coil-in-coil’ heat exchanger. Exceeds CHeSS* Best Practice for recovery times and insulation. Improved insulation for maximum heat retention. New water inlet controls increase flow rates by up to 20%. Improved performance at low pressures down to 1 bar. Complies with European User Products Directive. As a guide, the diameter of a standard Megaflo Eco cylinder is 579mm, and the height varies according to the storage volume. For example, a 145 litre cylinder is 1229mm, and a 210 litre (popular size for a medium sized house) is 1486mm. For a full list of specifications and dimension, please refer to the Megaflo Documentation.